Multiplayer has been rumored as a new feature for Mass Effect 3, but a recent BioWare comment seems to deny the possibility. Mass Effect 3 was recently revealed at the 2010 Spike TV VGAs, with just enough information to whet our appetites. Shepard is back, the Reapers are back, and Earth is in deep trouble, but what about that rumored multiplayer mode? According to BioWare, it might not be happening. 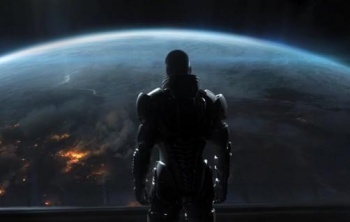 Rumors started flying about a multiplayer Mass Effect game after a BioWare job posting listed a position for a multiplayer programmer on the Mass Effect franchise. Less than a month before the reveal of Mass Effect 3, another rumor said that BioWare had been teasing a game for the VGAs that mixed Call of Duty's multiplayer gameplay with the Mass Effect universe. On the BioWare forums, moderator Pacifen may have confirmed that Mass Effect 3 won't have a multiplayer mode as previously rumored. In closing a thread, she wrote: "Now that Mass Effect 3 has been officially announced, I return to the age-old response to this topic: Mass Effect 3 is a single-player game. Thank you." If you were expecting a future reveal of a new multiplayer segment for Mass Effect, it doesn't look like it's going to happen in Mass Effect 3. Of course, this could mean that the rumors simply refer to another game that is still under lock and key, because BioWare has said that Mass Effect won't disappear after Shepard's third game. He could return someday for some lighthearted arena-based combat, but for now it looks like his primary focus is saving Earth. Update: According to a BioWare representative, this may have been a moderator overstepping her bounds. The moderator apparently should have written "BioWare does not comment on rumors," instead of hinting that Mass Effect 3 doesn't have multiplayer, and the post shouldn't be taken as definitive fact. Could this mean that the game will feature Mass Effect deathmatch after all?